Few among us can be described as a “titan,” but this is a word that embodies Jim Donnelley. Last week, our world became a little smaller with the passing of this extraordinary man. He was magnanimous and kind in a way that was truly larger than life. I didn’t know Jim long, only a year, but it was more than enough time to be enchanted by his passion, optimism, and generosity. 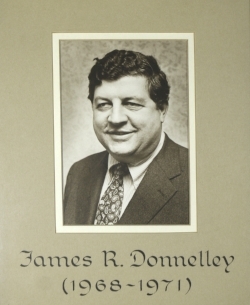 jIM DONNELLEY, THE SON OF cyc CO-FOUNDER ELLIOTT DONNELLEY, WAS THE cyc BOARD CHAIR FROM 1968 TO 1971. Jim, the son of Chicago Youth Centers’ founder Elliott Donnelley, passed away last Tuesday at the age of 83. To know Jim was to admire him. He was a man who loved the city of Chicago and cared deeply and intensely for its youth, and I was blessed to spend time with him. I learned so much from him about the history of this organization that his family was so instrumental in building. His father, along with Sid Epstein, founded CYC in 1956. Jim served as Board Chair from 1968-1971 and spent decades shepherding this agency through some of the most tumultuous times in our city’s history. Jim’s laughter was contagious and his advice was sage. He left an indelible impression on me, as he did on the thousands upon thousands of people who were fortunate enough to know him. His love of and support of CYC, as well as numerous similar organizations, are an example to us all that one person can make an incredible difference in a city, in a country, and in the world. It is a great honor and responsibility to be part of stewarding this organization that Jim loved so much. Passing on the promise of opportunity to Chicago’s youth has been our mission for more than 60 years. I, along with the Board and staff of CYC, will work tirelessly to make him proud. I know Jim is watching, encouraging us to continue to do the most important work where it is needed most. Information about Jim and his life can be found here. While it hurts to say goodbye to such an extraordinary man, his legacy will live on forever as an example of a life well lived.